Objectives Our aim was to determine whether emergency physicians (EPs) felt their standard patient evaluation practice was modified by two non-private clinical encounters: hallway encounters and encounters during which a companion was present. Methods We administered an iteratively developed cross-sectional survey at an annual national professional meeting. We used logistic regression to compare relationships among non-private clinical encounters and predictors of interest. Results 409 EPs completed the survey. EPs deviated from standard history-taking when practising in a hallway location (78%) and when patients had a companion (84%). EPs altered their standard physical exam when practising in a hallway location (90%) and when patients had a companion (77%). EPs with at least a decade of experience were less likely to alter history-taking in the hallway (OR 0.55, 95% CI 0.31 to 0.99). Clinicians who frequently evaluated patients in the hallway reported delays or diagnostic error-related to altered history-taking (OR 2.34, 95% CI 1.33 to 4.11). The genitourinary system was the most common organ system linked to a delay or diagnostic error. Modifications in history-taking were linked to delays or failure to diagnose suicidal ideation or self-harm (25%), intimate partner violence (40%), child abuse (12%), human trafficking (8%), substance abuse (47%) and elder abuse (17%). Conclusions Our study suggests that alterations in EP usual practice occurs when the doctor–patient dyad is disrupted by evaluation in a hallway or presence of a companion. Furthermore, these disruptions are associated with delays in care and failure to diagnosis medical, social and psychiatric conditions. Previous studies that look at emergency medicine hallway care have not explored the effects of lack of privacy on the physician’s physical exam and history-taking. Another potential mediator of physician behaviour is the triadic relationship (patient-companion-provider). This has been studied in geriatric, oncologic, endocrine, and primary care settings, but not in emergency medicine settings. In a survey of physicians attending a large emergency medicine conference, physicians reported alteration in practice occurs when the clinical encounter is in a hallway or because of the presence of a companion. Physicians perceived these alterations were associated with delays in care and failure to diagnosis medical, social, and psychiatric conditions. To maximize patient-centred, trauma-informed care for emergency department patients, the effects of non-private clinical encounters need further exploration. Emergency physicians (EPs) often treat patients for whom privacy and confidentiality are of vital importance in settings where privacy and confidentiality are difficult to protect.1 2 Two phenomena, the practice of evaluating patients in the hallway and the presence of a patient’s companion, change the environment for EPs as they perform their history and physical examination. Little is known about how the hallway environment or a companion’s presence impacts EP practice or patient outcomes. Our aim was to determine whether EPs perceived their standard patient evaluation practice was altered by two non-private clinical encounters: hallway encounters and encounters during which a companion was present. The aspects of the EP standard evaluation we explored were history-taking and the physical exam. Our study used a cross-sectional convenience sample survey of emergency medicine physicians. All study procedures were reviewed and approved by our IRB. Survey respondents were recruited at the 2015 American College of Emergency Physicians (ACEP) Scientific Assembly conference in Boston, Massachusetts. We established a booth in the exhibit hall using funding from the department of emergency medicine at our hospital. Our inclusion criterion was that the respondent should be a practising EP. Non-practising physicians and non-physicians were not eligible. The booth remained open during exhibit hours (10:00 to 15:00) for two consecutive days. Participants were entered into a daily raffle for a chance to win a $100 gift card to a local restaurant. A team consisting of three of the authors (JSB, ZM and AH) staffed the booth. Individuals were approached with scripted language and asked (A) if they were a practising emergency medicine physician and (B) if they were ‘willing to complete a short survey about their everyday practice’. The booth displayed posters with the study title (‘Dyad to Triad’) but no explanation of the content of the survey. The study involved a 22-item survey instrument (online supplementary data 1) to assess an emergency medicine practitioner’s modification of his or her standard patient interview or physical exam in relation to two types of non-private clinical encounters. These encounters included hallway encounters and ones where the patient was accompanied by another individual. Furthermore, the survey asked the respondents to report whether alterations in practice ever led to a delay or failure in diagnosis and, if so, the duration of the delay and the nature of the organ system, social issue or psychiatric condition involved. The survey was administered via laptop computers, using Qualtrics survey software. The initial draft of the survey was developed in conjunction with the survey experts after a literature review. Pilot testing of the survey was conducted with 25 emergency medicine practitioners across two academic institutions. First, a focus group of 17 emergency medicine clinicians was convened, followed by qualitative analysis and revision, and then cognitive interviews were conducted with eight emergency medicine practitioners to hone language and wording precision. Survey items were divided into three broad sections: demographics, history-taking practices and physical exam practices. The survey instrument used Likert scale (ie, never, rarely, sometimes, often and always) to allow EPs to report the likelihood of various behaviours. Sample size calculations for the project were performed using the Stata V.14 sampsi program. Briefly, based on the assumption that 50% of EPs who did not usually examine patients in the hallway would alter their physical exam in a non-private setting, a sample size of 400 would be necessary to detect an OR of 1.8 at a two-sided alpha level of 0.05 and a power of 0.8. Furthermore, a sample size of 400 would have been necessary to detect an OR of 2.0 at a two-sided alpha level of 0.05 and a power of 0.92. Logistic regression was used to understand associations among respondent characteristics (years of practice, frequency of seeing patient in hallways and gender) and the effect of disruption of the dyadic (provider–patient) relationship on clinical practice. Four hundred and nine practising EPs were recruited to complete the survey. All clinicians who completed the consent statement completed the survey in its entirety with no missing questions. 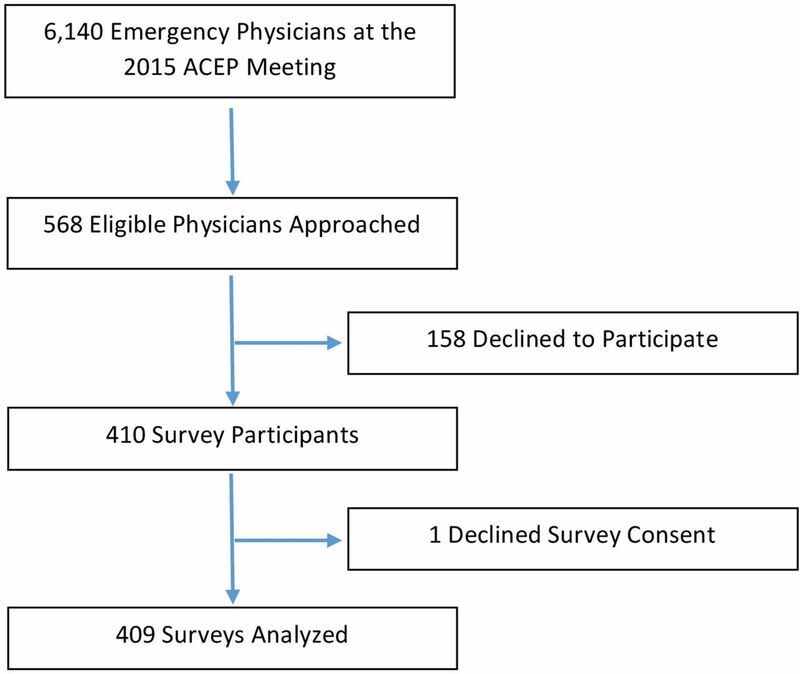 Of the 6140 physician attendees at the ACEP Scientific Assembly, 568 eligible physicians were approached, 158 declined to participate and 409 gave their consent and completed the survey, for a response rate of 72% (see figure 1). Sample size flow diagram. ACEP, American College of Emergency Physicians. Study respondents reported up to 40 years of clinical practice, with a mean of 11 years (table 1). Other characteristics of the EP respondents, including gender and frequency of providing care in the hallway can be found in table 1. Ninety per cent of respondents reported that they altered history-taking and 56% of respondents altered physical exams based on the presence of other people (table 2). The 369 respondents who reported modifying their history-taking were further queried about the reasons for alteration. Two hundred and eighty-six individuals (77%) replied at least ‘sometimes’ to their alteration based on the patient’s location in the hallway, while 310 individuals (84%) identified the presence of a family member, friend or acquaintance led them to alter their clinical history-taking. The majority of respondents, 306 individuals (83%), responded that the patient’s gender played no role in the provider’s decision to alter the patient interview. Self-report of alterations in physical exam mirrored those seen in history-taking. Of the 230 individuals who reported altering physical exam, a total of 206 respondents (90%) altered their exam at least ‘sometimes’ based on patients’ presence in the hallway, while 178 (77%) responded at least ‘sometimes’ to altering their physical exam due to the presence of someone known to the patient. A slightly smaller majority of providers, 177 individuals (77%), reported that gender played no role in their decision to alter their physical exam. Of the 369 respondents who reported alterations in their history-taking and 230 individuals who reported alterations in their physical exams, 129 and 94 individuals (35% and 41%), respectively, reported delays or failures in diagnoses related with these alterations. A similar proportion of delays (57% and 60%) in both categories were characterised as ‘by hours’ while only a very small percentage (2% and 2%) in both categories were delays on the order of ‘days’. Of those who reported alteration in history-taking, 92 individuals (71%) of the 129 respondents reported a delay or failure in diagnosis related to the genitourinary system. This finding corresponds to those who reported alterations in the physical exam, with 68 individuals (72%) of the 94 respondents identifying a delay or failure in diagnosis related to the genitourinary system. A majority in both history-taking and physical exam modification groups, 82 and 67 individuals (64% and 71%) respectively, identified no relation or delay or failures in diagnoses of psychiatric illness. Yet, nearly a quarter (25%, n=32) of those who altered clinical histories based on the presence of third parties reported a delay or failure to diagnose suicidal ideation or self-harm. Moreover, alterations in the patient interview yielded delays or failure to diagnose intimate partner violence (40%, n=51), child abuse (12%, n=16), human trafficking (8%, n=10), substance abuse (47%, n=60) and elder abuse (17%, n=22). Alterations in history-taking for patients seen in the hallway were significantly less common among EPs who had practised 10 or more years (OR 0.55, 95% CI 0.31 to 0.99) but were not associated with frequency of evaluating patients in the hallway (OR 0.90, 95% CI 0.90 to 1.76) (table 3). Both clinicians who practised in the ED for 10 or more years and those who usually evaluated patients in the hallways were more likely to alter their physical exam in response to the presence of others (OR 1.49, 95% CI 1.00 to 2.22 and OR 1.938, 95% CI 1.19 to 3.14, respectively). Clinicians who usually evaluated patients in the hallway were more likely than those who did not to report delays in diagnosis due to alteration of history-taking (OR 2.34, 95% CI 1.33 to 4.11). There was no association with alteration in patient interview due to a companion or due to provider gender. Our study suggests that alterations in EP ‘usual’ practice commonly happens when the doctor–patient dyad is disrupted due to clinical care in the hallway or the presence of a companion. Furthermore, these disruptions lead to delays in care and failure to diagnosis medical, social and psychiatric conditions. Due to ED crowding, hallway patient care is becoming increasingly commonplace. Care of the patient in the hallway caries logistical and ethical challenges, including affronts to human dignity, privacy and exacerbation of socioeconomic and race-related disparities.8 The results of this survey indicate a majority of EPs’ report altering their clinical history-taking (90%) during hallway care. These findings are similar to other studies examining communication between healthcare professionals and patients in non-private settings. A study by Chang9 demonstrated patients experienced worse communication when they received care in the hallway.9 The literature on ED crowding has demonstrated poor clinical outcomes, but hallway patient care as a disaggregated phenomenon is minimally explored as of yet.10–12 Our study adds to the hallway-specific literature on patient harms by showing that greater than one third of EP respondents reported delays or failures in diagnosis related to their deviations from their standard practice, and this delay was strongly associated with frequently seeing patients in the hallway. Notably, our finding of the predominance of delays and failure to diagnose conditions related to the genitourinary system is understandable as clinicians are forced to balance privacy considerations with quality care. This study used a convenience sample of EPs at an annual national conference and therefore cannot be considered representative of EPs nationally. Those who chose to attend the meeting, walk through the exhibit hall and ultimately participate may differ significantly from other EPs in the USA. Despite this, our study’s gender composition is similar to national estimates of EPs (males=62%, in our study 63%).19 Our sample captured a diversity of clinical experience, from 0 to 40 years of practice, with a mean of 11 years. Moreover, our response rate was 72%. As we did not collect data from non-responders, it is possible that there were significant differences between responders and non-responders. Interestingly, while we found that a general non-dyad clinical encounter affected the physical exam for those who usually see patients in the hallway, this relationship was not significant when examining the specific types of non-dyad encounters (ie hallway patient or accompanied by someone). It is possible these results were null because of sample size. Furthermore, as with any survey study, social desirability bias may have caused respondents to under-report less socially desirable behaviours. We attempted to mitigate this effect by reinforcing the survey’s confidential nature in the consent process. Therefore, the fact that 93% of those surveyed noted that they changed their usual practice and more than a third of participants noted an adverse outcome (either an error in or a delay in diagnosis) may be under-reports. Furthermore, our ability to capture patient outcome through self-report relies on memory and knowledge of adverse outcomes. Due to the transient nature of EP–patient clinical encounters, and lack of longitudinal follow-up, our data likely underestimate the occurrence of such errors. In order to capture patient outcome data better, other methodologies such as retrospective chart reviews and prospective trials could be employed. Other mechanisms to measure alteration in usual behaviour include video or direct observation, which may suffer from the Hawthorne effect, and become complicated in terms of patient confidentiality especially with concern to hallway patients. By using a survey methodology at a national meeting, we were able to efficiently capture the perspective of hundreds of EPs from across the USA, which would not be feasible through a direct observation study. Our study suggests that alterations in EP usual practice occurs when the doctor–patient dyad relationship is disrupted by two phenomena: clinical evaluation in the hallway and the presence of a companion. Furthermore, these disruptions lead to delays in care and failure to diagnosis medical, social and psychiatric conditions. Triadic clinical encounters, especially in the ED setting, are still poorly understood. To maximise patient-centred, trauma-informed care for ED patients, the effects of non-private clinical encounters need further exploration. The authors would like to thank The Harvard Catalyst Biostatistical Consulting Program for providing statistical support for this project.
. Hallway medicine: prevalence, characteristics and attitudes of hospital physicians. Isr Med Assoc J 1999;1:241–4. Contributors All authors contributed to the original idea for the paper and the writing and revision of it. HS and BR performed the data analysis. HS wrote the original draft. Funding This work was supported by the Tynan Fellowship, Mary Horrigan Connors Center for Women’s Health & Gender Biology, Brigham and Women’s Hospital and an intradepartmental grant of the Department of Emergency Medicine, Brigham and Women’s Hospital. Data sharing statement Unpublished data are available, by email request, from the corresponding author. Correction notice This article has been corrected since it was published Online First. A typo in the ’Key messages' box has been fixed (’What this study adds' section: ’alteration' instead of ’alternation').